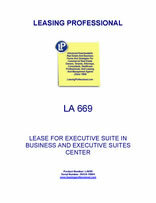 This form is for a short term executive suites lease in a business and executive suites center. The form contains a menu of desired services and equipment to be selected tenant, with individual charges for each item. This Lease is made as of _________________, by and between EXECUTIVE SUITES LANDLORD, INC., a __________________ corporation ("Landlord") dba Professional Executive Suites, and the tenant identified in section 1(b) below. Landlord is the operator of the Professional Executive Suites located at _______________________ (hereinafter "Center"). (d) Number of Occupants __________________. (f) Term of Lease ______________________. (g) Basic Monthly Rent _____________________. (i) Instrument, Voice Mail, PBX Charge: Phones ___ @$____ each, Total $ ____. (l) Total Monthly Basic Charges $____________________. (n) Telephone Deposit $ _____. (o) Key/Card Deposit $ _____. (p) Telephone Installation $ ______ (reg. $____/line). (q) Directory Listing $ ______. (s) Total Move-In Charges (Due Upon Lease Execution $_____. Total Amount Due at Lease Commencement $________. l. PREMISES. Landlord hereby Leases to Tenant and Tenant hereby leases from Landlord the Premises designated above herein, on the terms and conditions hereinafter set forth. The lease of the Premises includes reasonable access to common areas of the Center and the building including restrooms, corridors and reception lobbies. 2. TERM. The term of this Lease shall begin on the Commencement Date and shall continue for the term set forth above, unless sooner terminated pursuant to the terms of this Lease. Such term, and any extension given with the express written consent of Landlord, is hereafter referred to as "term." If Landlord is unable to deliver possession of the Premises to Tenant at the Commencement Date, Landlord will not be liable for any resulting damage, nor will this Lease be affected, except that Tenant will not be obligated to pay the basic monthly rent as hereafter defined, until Landlord delivers possession. If Tenant takes occupancy of the Premises prior to the Commencement Date such occupancy shall be subject to the terms and conditions of this Lease. (a) All payments to Landlord of Monthly Basic Rent and Monthly Basic Charges are due and payable in advance on the first of every month without demand, deduction or offset. Any additional charges are due and payable upon receipt of an invoice from Landlord. (b) Any payments not received within five (5) days after the due date will be subject to a late charge equal to six percent (6%) of the past due balance, but not less than $___ to compensate Landlord for the extra costs incurred as a result of such late payment. Payments received shall be applied first to basic monthly rent and then to other monthly basic charges in such priority as landlord may elect. (c) If Tenant fails to pay any amount when due, Tenant shall pay to Landlord interest thereon at an annual rate of ten percent (10%) or such lower rate as may be the maximum lawful rate. 4. USE. Tenant shall use the Premises as and for an executive suite (as defined hereinafter), and for no other purpose without the prior written consent of Landlord. Tenant shall abide by all laws, ordinances, rules and regulations pertaining to the use of the Premises including, without limitation, the Rules and Regulations for the Center in which the Premises are located. (a) "Executive Suite" shall mean an office to be used for professional business purposes and the use of adjoining facilities for services provided to and shared by other clients of Landlord. (b) Tenant agrees that Tenant will not offer or use the Premises to provide services provided by Landlord to Landlord's clients, nor make nor permit any use of the Premises in any manner which is forbidden by law or regulation, or may be hazardous or unsafe, or may tend to impair the character, reputation, appearance or operation of Landlord. Only telephone equipment and services approved by Landlord may be used in the Premises. Tenant agrees that any ringing or communications devices, e.g., pagers, will be adjusted to the lowest reasonable ringing volume. (c) Tenant understands and agrees that occupancy of the Premises is subject to this Lease. Tenant will comply with all rules, regulations, and requirements of the Center in which the Premises are located and with other reasonable rules and regulations established by Landlord and relating to the Premises and Tenant's use thereof. Landlord will have no responsibility to Tenant for violation of any lease provisions or rules and regulations by any other Tenant of Landlord. (d) In Landlord's sole and absolute discretion, upon thirty (30) days prior written notice to Tenant, Landlord shall have the right to relocate Tenant in comparable office space within the Center. Tenant agrees that all terms and conditions of the Lease will remain the same. Landlord will incur all reasonable out-of-pocket costs associated with any such relocation. Tenant shall not be entitled to any compensation for any inconvenience or interference with Tenant's business, nor to any abatement or reduction in rent, nor shall Tenant's obligations under this Lease be otherwise affected. (e) Tenant shall neither use nor occupy the Premises in any manner, nor commit any act, resulting in a cancellation or reduction of any insurance coverage or increase in premiums on any insurance policy covering the Premises or the property or Center of which the Premises are a part. Tenant agrees to maintain a commercial general liability policy with a minimum limit of $1,000,000. Failure to furnish Landlord with an endorsement of insurance naming Landlord as an additional insured shall constitute a material breach of this Lease entitling Landlord to terminate this Lease. 5. IMPROVEMENTS AND ALTERATIONS. Landlord has made no promise to alter or improve the Premises or Center and has made no representations concerning the condition thereof. By taking possession of the Premises, Tenant acknowledges that they are in good order, condition and repair and accepts the Premises and the Center in its "AS-IS" condition as of the date of this Lease. Tenant shall maintain the Premises in good condition and repair, will not make holes in walls for any reason except the normal and reasonable hanging of pictures, or cause or permit the Premises to be damaged or defaced in any manner whatsoever. Tenant will make no alterations or additions to the Premises without Landlord's prior written consent, which consent Landlord may grant or withhold in its sole discretion. Tenant will return the Premises at the end of the term in as good of condition and repair as when Tenant received the Premises, reasonable wear and tear excepted. Tenant shall provide, at Tenant's expense, a plastic mat(s) to be placed under each chair located within the Premises and will use it at all times. If mat(s) are not installed within one week of move-in, Landlord will purchase and install mat(s) at a cost to Tenant of $____ each. Landlord may, but is not required to, make repairs or replacements for Tenant's account, and Tenant will pay to Landlord all costs and expenses for such repairs and replacements upon demand. It is also agreed that damage or injury done to the Premises, by Tenant, or by any person who may be in or upon the Premises with the consent of Tenant, other than from normal wear and tear, shall be paid by Tenant. Upon termination of this Lease, whether upon expiration of the term hereof or sooner, Tenant agrees to pay to Landlord the sum of $____ per leased office to cover painting costs for each such office.